Something HUGE happened yesterday. Something very exciting. Can you guess what? My car’s odometer rolled over to 100,000! And I managed to take pictures without crashing into the BMW in front of me or taking out the well-toned rider in the bike lane! I love the symmetry of this next mileage number. It’s so binary! So, did anything else big happen yesterday? Another one here who is pleased to see that I am not the only one enchanted by nifty numbers on the odometer. Of course something else big happened yesterday – I finally finished my enormous chocolate bunny from Easter so I can get back on track with my diet. It is a bit scary that it only took me a week to eat the equivalent of more than two family-size blocks of chocolate, but Easter (for me) is now officially OVER. @Natalie – Only a week? That’s a long death for a chocolate bunny in my house. 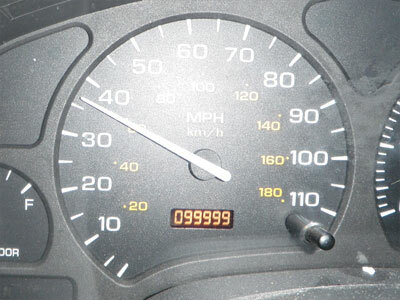 I’ve only had one car that I kept long enough to pass 100,00 miles, but I remember it was pretty exciting! Outstanding! 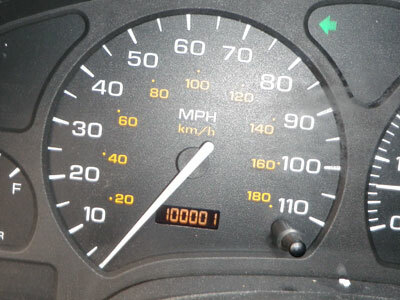 My car’s odometer will roll over to 100,000 miles at some point in the next few months. I really hope it happens at a place where I can pull over and snap a picture… but with my luck, I’ll be doing 75mph on I-90. Le sigh. Milestones like that are so exciting! 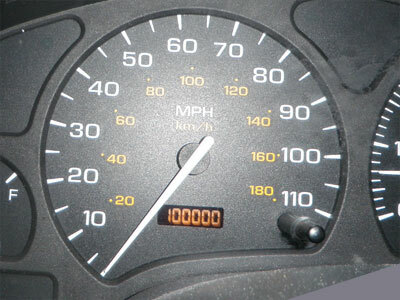 My car hit 100,000 miles on my 30th birthday. Double rollover!